With deep sadness the family announces the passing of Adeline Wolfram, on Sunday, January 13th, 2019 at the age of 84 years. Survived by her beloved spouse Albert, who she was joyfully married to for 64 years, her 3 children, Allan (Joyce), Gail, and Tyrone (Connie); her treasured granddaughters, Julia, Andrea (Justin), Teri-Lyn (Craig) and her very much-loved great-grandchildren Ella, Autumn, Violet, Hunter, Wylder and William. She is also survived by her sisters, Ethel, Judy and Diane; her brothers, Harry (Carol), Ernie, Dennis (Marilyn), Lenny and Kenneth; her sisters-in-Law Elaine, Eve and Donnie and many much-loved nieces, nephews, cousins and dear friends. She was predeceased by her parents, Sam and Annie Kolton, her brother Randy, her sister Betty, her niece Heather and beloved son-in-law Mike. Adeline was born and raised on the Kolton family farm in Dencross, Manitoba. 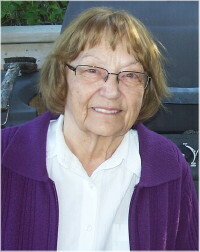 She moved to small apartment in Winnipeg as a young woman with her sisters Ethel and Betty and her Auntie Mary for work. That’s when she caught the eye of a tall good-looking young man at a dance named Albert. Albert eventually won her heart and they were married at Knox United Church in Winnipeg on September 4, 1954 and they began a life together. After marriage they moved to Pine Falls, Manitoba, where they started their family with Allan and Gail. From Pine Falls they moved to Vermilion Bay Ontario to manage a Gas station and restaurant, but the pull of family had them moving back to Winnipeg to start a restaurant, in partnership with Gus and Eve. Tyrone was born shortly after moving back to Winnipeg completing their family of 3. Adeline worked for many years at Pauline Chamber’s cookie factory. Adeline always believed in family first, taught us the benefits of hard work and made sure we knew we were loved and cherished. She was not one who would be idol for very long. She loved her vegetable gardens and would spend hours tending it and happily shared vegetables and preserves with friends and family. She loved to solve word puzzles in the daily newspaper and often collaborated with her friend Verna. Adeline had a very special bond with her grandchildren–Julia, Andrea and Teri-Lyn. Her “sweethearts,” as she fondly referred to them were fortunate and blessed to spend their summers together at their grandparents’ home on “the 2 acres”. This was a place they created many fond memories that set the foundation of a lifelong friendship. They will be forever grateful for all the love and support they received that helped to mold them into the people they are today. Once the nest was empty and Adeline and Albert retired, off they went travelling across North America. They travelled with Gus and Eve to the Florida Keys, then with Harry and Pinky, Danny and Marilyn to New Orleans, Brownsville, Vegas, Oosoyos, settling down for winters in Yuma, for sightseeing, playing cards and golfing. Adeline and Al always had an open door, where all were welcome with a good cup of coffee and a plate full of food (especially Paulin Puffs cookies). Their home was filled with lots of love, laughter and often visiting family. Albert, along with his family would like to thank everyone who spent time with Adeline during her illness. Specifically we would like to thank Denise for being their personal hairdresser, her beloved sister Diane for selflessly helping with mom’s care, her brothers Kenny and Lenny for helping with transportation for dad’s visits, Judy, Denny, Marilyn and Ethel for making the trip from out of town to celebrate mom’s 84th birthday and Debbie for taking time from her visit from the east coast to visit Mom at Seven Oaks. The family would also like to thank all the staff at The Maples Care Home, Misericordia Health Centre and Seven Oaks Hospital for all their care and attention to Adeline. She lived a good life with Albert, the love of her life, blessed with a wonderful family. In lieu of flowers, please donate to the Mars Hill Cemetery or the Alzheimer’s Society. Interment and a graveside memorial will be held in the spring. Very sorry for your loss. Thinking of you at this time. Mrs Wolfram, A little woman with a huge smile and generous spirit. I never new her name was Adeline! Beautiful name for a wonderful woman. Gail’s mom and Lacey’s gran. I’m sorry for the family’s loss. I know many hearts are hurting but Angels are smiling . Sincere condolences to Albert and our Wolfram cousins on the passing of dear Adeline. May your precious memories bring you Peace and Strength during this difficult time of loss. Prayers and love to you all. Auntie Adeline could always make you smile. She will be missed. Our condolences. My sincere condolences to the Wolfram family. I have many Winnipeg memories of playing cards, eating Chinese at new year, going to Celebrations and many visits with Adeline and Al. A loving couple.